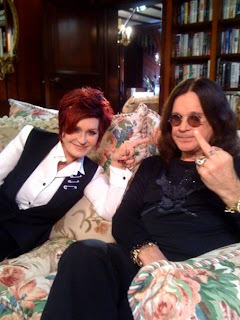 Ozzy and Sharon Osbourne sold their California home for $11.5 million and managed to lose money in the process. The Los Angeles Times reports the Osbournes initially purchased their Hidden Hills estate in 2007 for $12,388,500 according to public records. The property was put on the market in 2011 at $12.999 million and was also listed for lease at $50,000 a month. The Cape Cod-inspired mansion, built in 2001, sits on a 2.5-acre promontory off a cul-de-sac in the gated community. It features a paneled study with fireplace, a home theater and studio area, six en suite bedrooms and a guest apartment with kitchenette. The family room of the 11,000-square-foot home has sliding barn doors and a reclaimed brick fireplace. The grounds include a swimming pool, spa and a barbecue island. A bathroom by the pool raises the total number of baths to 10. Ozzy and Black Sabbath will release their new album, “13,” this June. The band will launch its world tour in support of the project with a series of dates beginning next month in New Zealand, Australia and Japan.